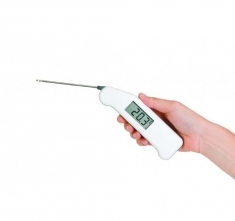 The Thermapen thermometer is also available with three alternative styles of probe; surface, air or penetration. The fast response air probe is an invaluable tool in establishing the correct air temperature quickly in HVAC and laboratory applications. The surface probe is particularly useful in determining the temperature of hot plates or pipe temperatures etc. Please note the accuracy and speed of response will be dependant on whether the surface is flat and heat transfer compound is used. The Thermapen thermometer incorporates a large digital display with a precise read-out over the range of -49.9 to 299.9 °C with a 0.1 °C resolution and an accuracy of ±0.4 °C. The resolution can be switched to 1 °C, if required, via a switch in the battery compartment. The thermometer will power off automatically after ten minutes, maximising battery life. This feature can be disabled if not required. Both low battery (icon) and open circuit indication are also displayed, when applicable. Each Thermapen is powered by two lithium coin cell batteries with a minimum life expectancy of 1500 hours. To view the range of optional accessories for the Thermapen industrial thermometer please click on the accessories tab. Holder, til vægmontering af forskellige termometermodeller.